Hurricane Paul swept through the Baja and Sea of Cortez region last night, bringing sproradic rain and winds. Nevertheless, several boats moored in the bay were swept aground and efforts made by the local crusiers were mostly successful. As of this writing, only one boat remains aground, although the boat that was pulled from certain death on shore sported a hole in her bow. Lucky boat! It was not a restful night with the boat pitching and swaying, but we were safe. Today, the air is not only very hot but very humid, an expected side effect of Paul's tropical birth. Wings looking more like her old self. 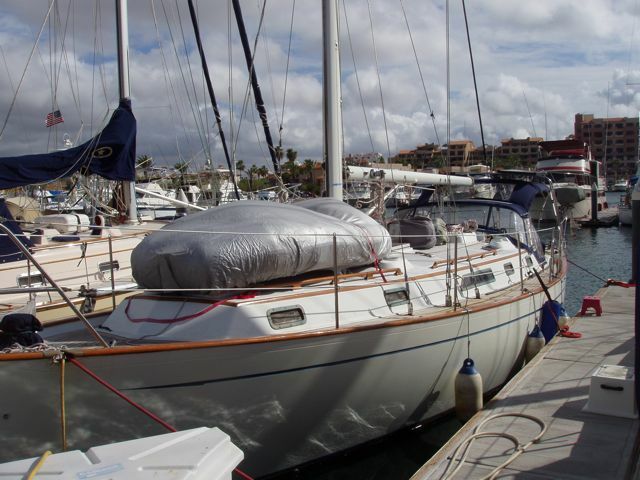 The dinghy is strapped to the foredeck but no sails are on since we feared that they might be damaged in possible heavy winds. The dark clouds in the background are in the south and are the remnants of Hurricane Paul's passage. It continued to blow all day and the weather was very hot and muggy. Finally, a good photo of our new panels and the ham antenna. The panels are bolted to the framework and are out of the way but exposed to whatever sunlight is around. 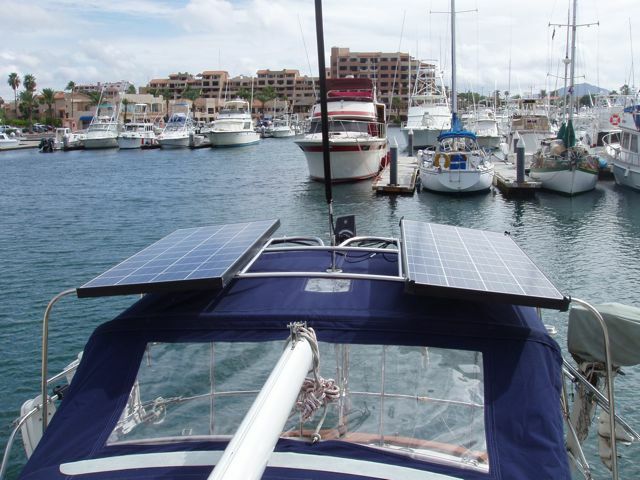 The large black "backstay" between the two panels is the new ham antenna wrapped around the backstay. 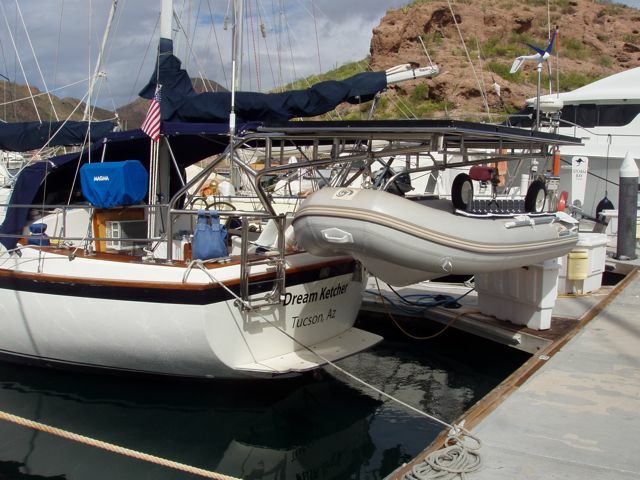 Our friends, Rich and Sue, live on Dream Ketcher, the 1970s vintage Pearson ketch: hence the name. 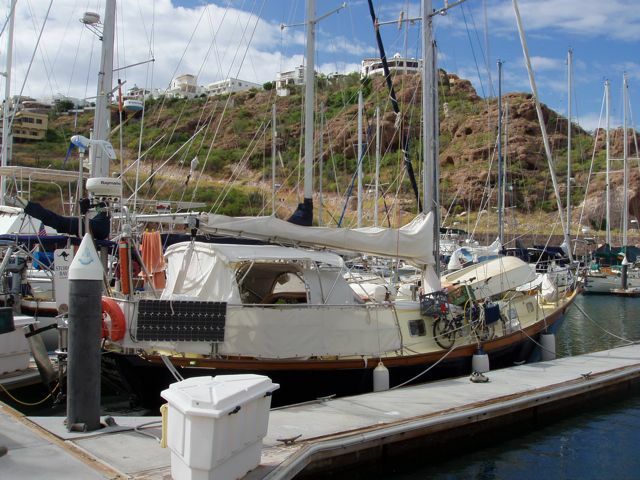 They had fabricated this enormous and strong dinghy davit that also supports four panels, each the same size as one of ours. Lots of solar! Storm Bay, a steel sloop from Tazmania. They've been cruising from Tazmania for ten years, having circumnavigated the Pacific, traveling through Micronesia, Japan, Korea, and Aluetians. They even stayed a while in our old home port of Seward! 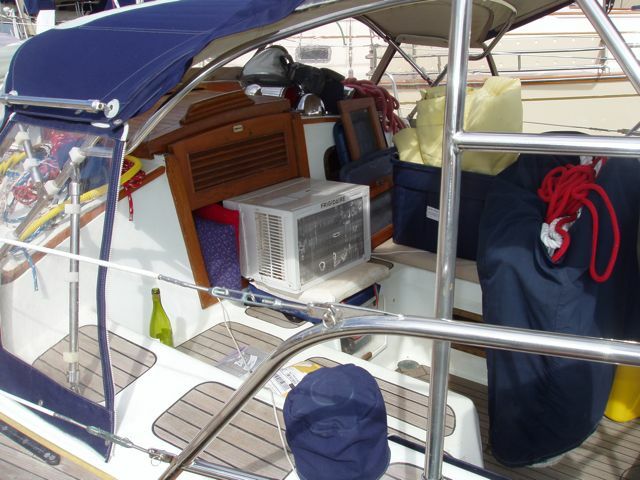 This is real cruising sailboat, well equiped for any situation. 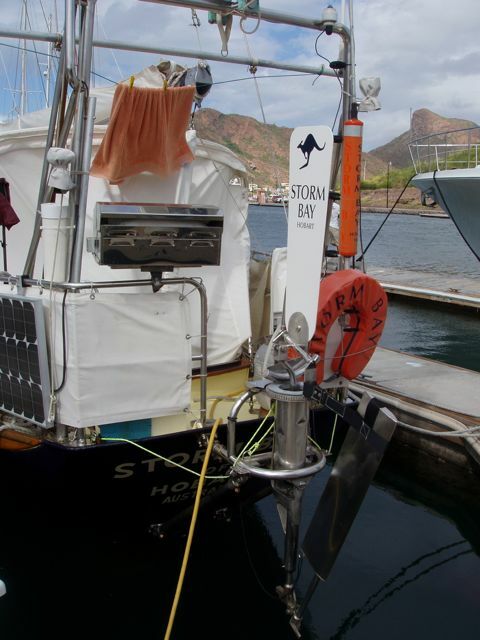 Another view of Storm Bay showing her self-steering and solar panels. Hector Morales loaned this AC to us and it's made all the difference in our comfort.